The word roulette conjures up images of tall ladies in ball gowns standing nonchalantly with fur around their shoulders, and men in formal black tie get-up saying things like 'I'm putting it all on red', then taking a sip of whisky on the rocks. The origins of this glamorous image make sense when you realize roulette was invented in France. After all France is truly the home of all things sophisticated and chic! Try your hand at this classic variation of roulette at a top online roulette site like our best recommended one of the month: Slots.lv Casino. The idea of betting on where a ball would fall on a numbered wheel was invented in the 1800's in France, they dubbed it roulette and knew the public would love it. But it was bad news for the inventors and gambling fans in France because gambling was illegal at the time. Instead of becoming a real crowd pleaser in France, where it was banned, the game became massively popular in nearby Monte Carlo where it was completely legal and punters were falling over themselves to play this new exciting game. Later in the early 20th Century the government of France decided real money gambling would be made legal across the country and so roulette came back to the place where it was born. However, the French fans soon realized that the house edge was pretty high for a game that was meant to be fair, so they made a few changes…these rules still apply today and they're what make the game different to American and European roulette. And it is that difference you should note in your roulette playing strategy. French roulette uses the same wheel as European roulette, which means it has a single zero as opposed to the American wheel which has two zeroes. The main thing that makes real money French roulette unique is the La Partage rule, which means 'the shared' in French. If you make an odds or evens bet and the ball lands on zero, you'll get half your bet back. Although it sounds pretty minor, this one rule actually reduces the house edge because the casino will take less money than if it was a European or American roulette game where the player would lose their entire bet. The La Partage rule reduces the house edge from 2.7% in standard European roulette to just 1.35% in French roulette. As with all roulette games, there really is no golden how-to-win-big rule. If anyone tells you differently, don't believe them because they probably want to sell you a book or presentation about their winning system! Firstly, bet small and often but stay within the realms of what you can afford. Betting a lot more after a big win thinking you're on a lucky streak or betting loads after you lose to make up for your losses is not a good idea! Take advantage of the even money bets in French roulette, odds and evens is the bet to make if you want to make your session last longer. Thanks to that La Partage rule, you'll get half your money back if the ball lands on zero. Although half back is hardly a win, it's a lot better than getting nothing back which is what happens if you bet on anything else and your number doesn't come up. 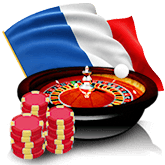 If you want to play a classic roulette game and have better chances of walking away with a pocketful of cash, French roulette is your friend. Also, with our top 10 tips, you can increase those chances even further so why not stop by an online casino and say bonjour to French roulette - it could be the start of a beautiful relationship! Play French Roulette for free, click here. French Roulette is European Roulette with only one single difference. French Roulette has a La Partage rule. This rule means "the shared." It is an insurance bet on zero that protects your bet should the ball land on zero. The La Partage bet increases your chances of winning, and decreases the house edge from 2.7% with the European wheel to only 1.35%. Coupled with the En Prison rule, a player can really increase their odds of winning. How does French Roulette work? 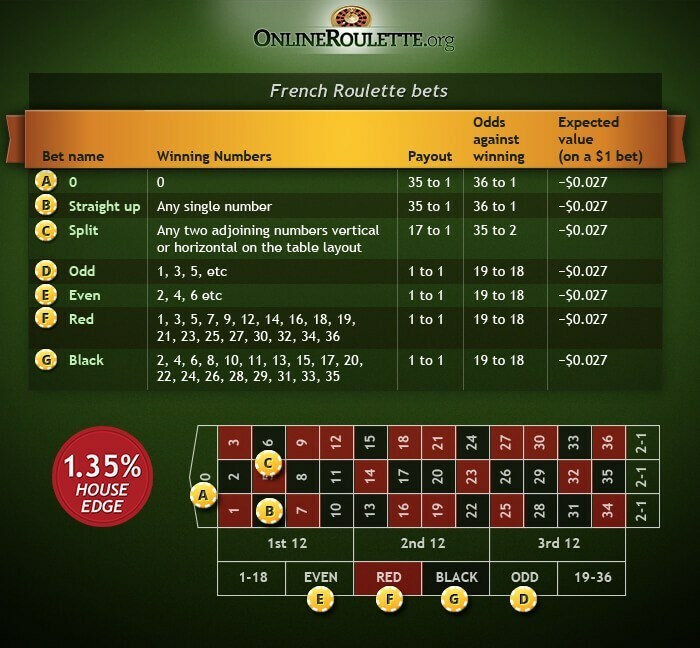 French Roulette is a very popular game because it is a simple game to learn. When playing at a brick and mortar casino, you will buy in at the table, then the dealer will give you a specific color of chips that are exclusively yours to use. This is because of the popularity of the table, and helps you and the dealer keep track of your bets. You will have a certain time to place your bet prior to the croupier announcing no more bets, and the ball will be dropped onto a spinning wheel. With online Roulette, you deposit your funds and then begin placing bets. You will automate the spin and watch your numbers win. The only difference with the French variety is that you have an extra bet to make, should you choose to take advantage of the La Partage rule or the En Prison rule. French Roulette is not as popular as European Roulette, but many people really enjoy the added bonus of La Partage rule when coupled with the En Prison rule. When placing even money bets, your bet will be returned in full should the ball rest on zero, or receive half the bet, with the full bet remaining on the table for the next spin. Is it much different from other variations? It is different in that the odds change when a player invests in the La Partage rule. However, many players will tell you that investing even money with insurance bets actually takes money from your bankroll and are unwise investments. The odds of landing on the zero are the same as the European Roulette. The French variety is definitely better than the American Roulette, which has a zero and a double zero. Are the odds more favorable? The odds are definitely in the players favor when incorporating the La Partage Rule in conjunction with the En Prison rule. These rules decrease the house edge from 2.7% to 1.35%, which means that you have an increase due to the application of these rules. The best system or strategy to play online Roulette is born of remembering what's happening in a game of Roulette. Keep in mind that an RNG - random number generator - is at work, so the numbers are totally random. Unlike a live casino, there is no table bias to look for. Remain within your means. Never bet more than you are really willing to lose. Maintain a good ratio of bankroll to bets. Many suggest only 3% of your bankroll on any given bet. As you begin to win, you can either pocket your wins and maintain that level, or splurge a little - after all, you are playing on the house at that point. Stick to even money bets such as black/red, even/odd, and then column bets every now and then, which pay 2:1. If you have that feeling in your gut that a number is going to come up, go ahead give in now and then. But remember that it is a game of chance, and so don't let your gut dictate every aspect of your strategy.